I will be 40 years old in a few short months, and I love dessert. I am come to understand the hard way that those two facts do not agree with one another. As my metabolism has slowed and my doctor's warnings have grown louder, I'm come to realize that I can no longer partake in after dinner delights of cookies or chocolate. And rather than completely go cold turkey, I have been on a quest to find "healthy" treats that will satisfy my sweet tooth while also staying on course with my health goals. Easier said than done, for sure. 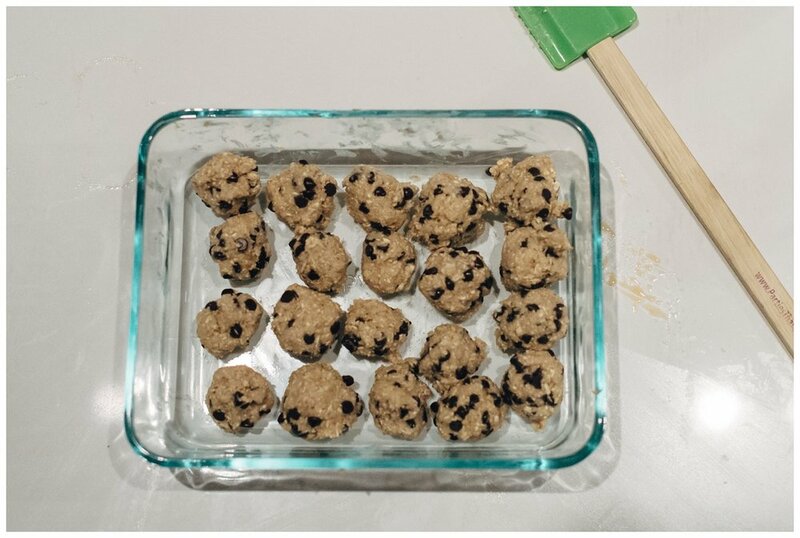 My kids and I recently discovered a recipe for Raw Cookie Dough Balls, I've we've made a bath of them just about each week for the last few months. We make them so often that my four year old now knows the recipe by heart, and I'm convinced he could make them all by himself if only I'd let him use the food processor. They are delicious, don't require cooking hence the term "raw" in the title- duh Rhea! ), and are gluten/dairy/soy free! Oh and they are SUPER easy to make. In a food processor, add the oats and pulse for 20 seconds in order to break the oats down slightly. Add the rest of the ingredients (EXCEPT the chocolate chips) and pulse until fully combined. If the dough is too sticky/soft, refrigerate for ten minutes to harden it slightly, then roll in to 12 balls and refrigerate for 1 hour. And there you have it! Yummy goodness! Try them and leave a comment below to let me know how you like them.